← A New Take On Sequins! Do you like to go all out when it comes to fabric selection? Do you love the way new and elaborate designs light up your projects? The you’ll want to consider Vegas Damask Sequins Stretch Power Mesh Fabric. This carefully designed fabric showcases a beautiful Damask pattern featuring swirled vine motifs and downward dripping lines reminiscent of rain or icicles. With the addition of meticulously placed sequins, the design truly shines. It comes in twelve glittering colors, including Black, Turquoise, Champagne, and Red. With so many bright and subtler shades to choose from, you are sure to find an option that fits your project. Some fun ideas might be creating a clutch purse, skirt, or dress! 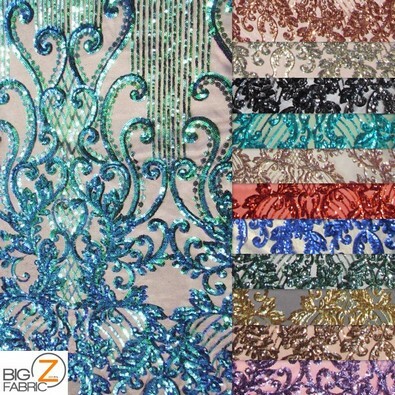 Vegas Damask Sequins Stretch Power Mesh Fabric has a width of 52 to 60 inches and is made of polyester. This fabric has a two way stretch, so it will be comfortable when worn. It also has finished edges, making sewing a bit easier and keeping the fabric from unraveling. It is available for $24.99. You can also request a $1 sample to see it in person first. This Damask fabric is sure to add a little magic to your next project. This entry was posted in Nylon Sequins Fabric and tagged power mesh, Sequins, Sequins Fabric, vegas damask. Bookmark the permalink.